A bit of running advice. Allow a complete contraction of the extensors (gluteus maximus, hamstrings, and calf muscles). Allow a complete contraction of the flexors (Sartorius, iliopsoas, frontal calf muscles). Increase your speed by increasing thigh spread (the distance between your swing thigh and your pushoff thigh). 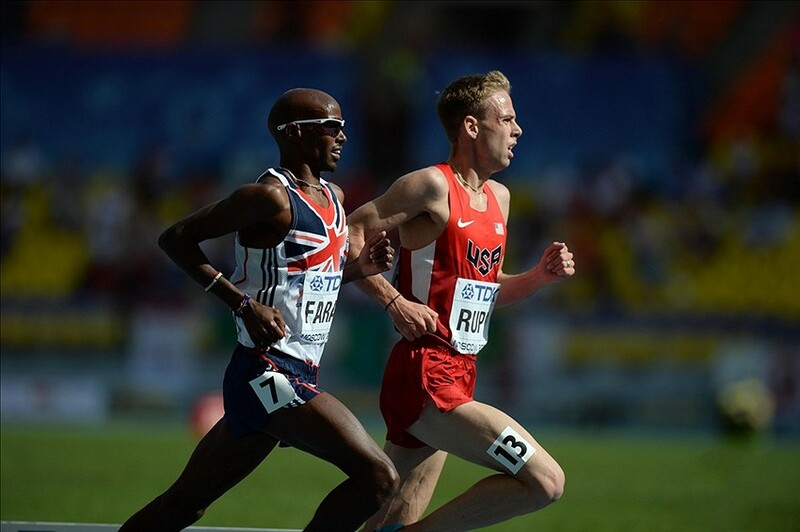 Look at Galen Rupp and Mo Farah in the picture above: their swing thighs are in a very similar angle to the ground despite Galen being in late stance phase and Mo in early pushoff. (The main difference is the angle between their thigh and their calf, not the thigh and the ground). You can see that their swing hip is completely rolled forward, meaning that their feet (off camera) can easily manage full pronation. Floating the knee should feel like you’re falling, similar to what you feel during a lunge, except that your foot ends up coming down under the center of gravity. You should feel your swing hip hike up and your pushoff hip press down. Master this by skipping, focusing on bringing your knees far, far in front of your body with your thighs in a straight line. Bonus points: Look at their body geometry. At the height of the swing phase, you can draw a straight line from the top of the knee to the bottom of the elbow in both athletes, smoothly connecting thigh and forearm. Elegance always holds the key to speed. Previous PostDeconstructing the Plateau: Part 2Next PostHow do we measure athletic performance?